Ski holidays in Bled offer some of the most picturesque skiing in the world for a great price. We find Bled and Bohinj in the North-Western part of Slovenia in the Julian Alps. Straza is the main skiing area and there is also a free 20 minute bus to the two ski areas of Vogel and Kobla on the slopes of Mount Trigval where you can ski up to 1800m. The skiing here is ideal for beginners. The English speaking ski school is excellent and great value for money if you have never skied before. Intermediates will find some challenging reds and black slopes which are great to improve on. 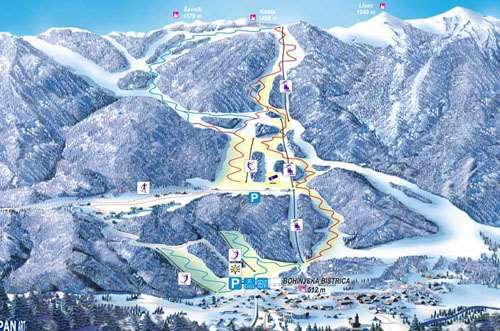 Advanced skiers will probably find the areas quite limiting but there is plenty of scope for off piste with a guide available at a very reasonable price. The standard of service and accommodation for ski holidays in Bled and Bohinj is very high and it all adds up to a great budget skiing package for the novice and virgin skier. Bled also has restaurants and lively bars for when the visitor is off the slopes.